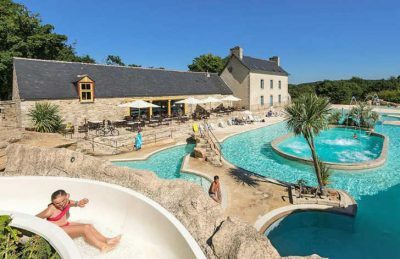 Domaine L’Orangerie de Lanniron is a 5 star campsite located in Quimper in the Brittany region of France. Domaine L’Orangerie de Lanniron is a brilliant family friendly campsite that lies in the grounds of a beautiful chateau which was once the bishops residence. The grounds of Domaine L’Orangerie de Lanniron extend to around 90 acres and gives you plenty of woodland and meadows to either explore or just relax in. The campsite is a truly extraordinary holiday location which will delight a whole range of different people. Birdwatchers will love the vast array of birds that can be seen from its riverside location, the gardens and woodland provide the perfect place for nature lovers and those more sporty visitors will simply love the amazing range of activities on offer. As with many French campsites, the main facilities are housed within some of the beautifully renovated stone buildings that would once have been part of the estate. This gives a truly wonderful feeling and atmosphere to the campsite. If you want to discover the surrounding areas you’ll be pleased to know that Domaine L’Orangerie de Lanniron is in the perfect location. There’s so many places to visit and things to do within a short distance of the campsite that you really will be spoilt for choice. The nearest beach to the campsite is around 15km away at the popular seaside resort of Benodet. Here you’ll find a stunning beach covered in sand and that offers everything you could possibly want. Further along the coast in either direction you’ll find a number of other beaches should you wish to explore further. As you’d expect from a campsite of this quality the swimming pool facilities at Domaine L’Orangerie de Lanniron are excellent. The swimming pool complex offers a huge outdoor heated pool, tropical leisure pool and also a heated toddler pool and slides. Domaine L’Orangerie de Lanniron campsite offers a comprehensive selection of activities and facilities on site and also nearby to ensure you have a fantastic family holiday. On-site activities at Domaine L’Orangerie de Lanniron campsite include a golf course, driving range, tennis court, wellness centre, trampoline, bouncy castle, multi sports field, football, basketball, volleyball, table tennis, mini golf, boules, pony trekking, fishing and cycle hire. Facilities available at Domaine L’Orangerie de Lanniron campsite include WIFI, restaurant, snack bar, pizzeria, takeaway, bar, groceries, games room, tv room, animation team, washers and dryers. Accommodation at Domaine L’Orangerie de Lanniron campsite includes a range of 2 and 3 bedroom mobile homes that are available from Suncamp. You can also book camping pitches for your own tent, mobile home or caravan at Domaine L’Orangerie de Lanniron campsite.